These are the stories and photos of the pets rescued by our PACC911 LAF during 2016. Read through these heart wrenching stories to discover how PACC911 makes a powerful difference saving pet lives in our community. Just click on each arrow to see the special stories and photos. The images reveal the startlingly dramatic before and after situations, reminding us all that we CAN make a difference. You too, can get involved. After reading, just click to go back to the “how you can help/donate section. We don’t know who dropped off the two bedraggled old souls, but they showed up at the county shelter huddled together and frightened. Greying muzzles on each of them and mouths full of decayed teeth told staff at county they were well into their senior years. Bug was assumed to be above 15 years. Obvious victims of a local puppy mill, they had both been bred many times over, had mammary tumors and neither one was spayed. Bug was also completely blind. They apparently had outlasted their usefulness in producing litters, and so were thrown away. Perhaps this was their luckiest day. Both were taken by Arizona Happy Tails Rescue and placed into loving foster homes. The love and comfort they felt for the first time helped them to acclimate quickly. While Lucy seemed more adoptable since she did have sight, the rescue team worried about who might adopt Bug, who was so old, and so blind. Bug came into our home and quickly learned who was who in the dog pack. She greeted and accepted all of our dogs and made herself fit right in. She learned to follow the others especially in and out of the doggie door. I was told she was not housebroken, but she had few accidents. In a short time she came to be another family member and knew that she belonged. It was hard to remember that she was blind as she navigated so well and so effortlessly. Our time together was too short. Bug was only with us for six months but that was ample time to fall deeply in love with this wise and wonderful soul. We wanted so much to make up for the many years that she had suffered knowing only neglect and pain. Sharing her wisdom and love in her final months on this earth was our greatest pleasure and I will remember her always. Seniors are wonderful. They ask for little and give so much. I am so glad she passed in my arms, on her time frame, rather than in a cold shelter with no one to love. 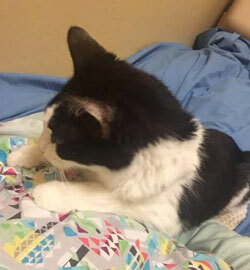 Adorable Oreo had issues with his spine and lost use of his back legs. 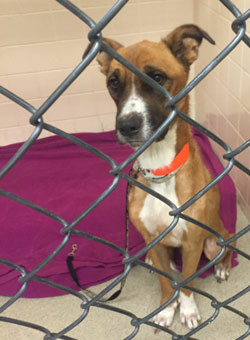 This poor boy’s family simply gave up on him turning him in to the shelter to be euthanized. In stepped Oreo’s saviors! 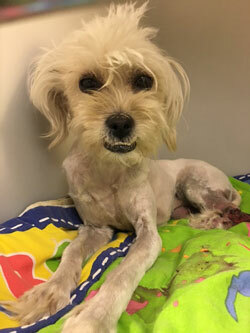 Arizona Poodle Rescue and PACC911’s Lulu’s Angel Fund had faith in this little guy, and pulled him from the shelter so he could get medical treatment. 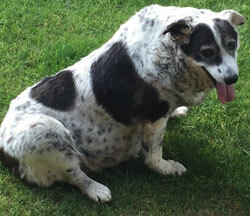 Oreo had spinal surgery for a ruptured disc and, in time, should be back on all fours! He will be looking for his true forever family soon. 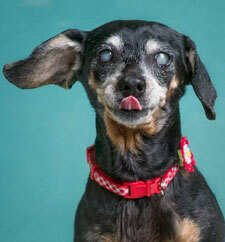 Jackie, a sweet senior, was found as a stray and taken in by a good Samaritan. Her rescuer tried to find her family, but sadly, no one came forward. 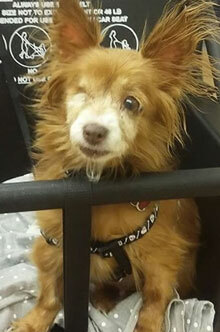 Poor Jackie was missing one eye that had healed, and her belly was covered in large tumors. She needed medical attention right away. America’s Freedom Paws Rescue came to her aid, and took her into their rescue. PACC911’s L.A.F. Program assisted with medical costs. Jackie’s surgery to remove the tumors was successful, and she was back to being a snuggly cuddle bug in no time. In fact Jackie was adopted! She is now safe and loved in the arms of her new forever family. 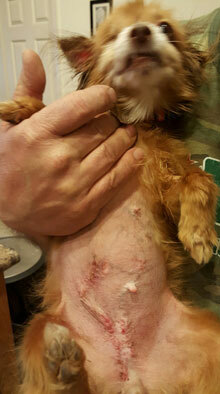 Lola was found on the streets, close to death due to an infected, gaping, gash on her back leg and hip. 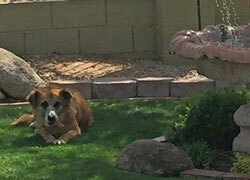 She was taken to Maricopa County Animal Care and Control. Though, she was brought in late Sunday evening, MCACC and HALO, Helping Animals Live On rescue, took urgent action that night to get Lola medical attention to save her life. PACC911’s L.A.F. Program assisted with medical expenses. Lola was critical, but even in unbearable pain, she sent her rescuers an encouraging message by wagging her hopeful, nubby tail. Lola spent a crucial week in the hospital before she was ready for surgery, but she and her saviors would not give up. All went well for this precious girl. 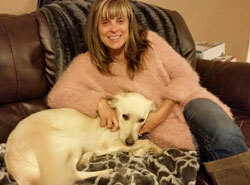 Lola made a full recovery, and has been adopted by a loving family. Lydia did not know what it felt like to be loved. Sadly, day after day, Lydia’s physical and emotional needs were ignored as she and her two siblings spent their days outside in the yard, and their nights confined in a crate. Lydia was hurting. She had an open abscess on her eye that needed surgery, an ear infection, and other wounds for which she had not received medical attention. Thankfully, Lydia and her siblings were surrendered to Luv of Dogs rescue that got her the much needed surgery and medical care with financial assistance for PACC911’s L.A.F Program. Lydia’s body has healed, and she grows more confident each day as Luv of Dogs volunteers mend Lydia’s soul with hugs, kisses, and heartfelt love. 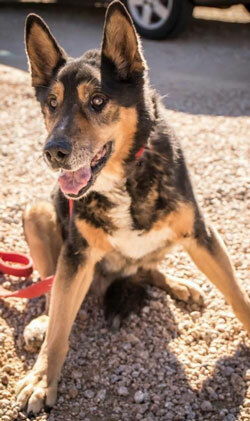 June, a young cattle dog, had been bred constantly to the point that she developed tumors and was then dumped at Maricopa County Animal Care and Control by her owner. MCACC volunteers sent pleas to the rescue community to save this girl so she could know a happy life. Panacea Animal Wellness Sanctuary rescued June with financial assistance for surgery from PACC911’s L.A.F Program. As June prepared for her surgery, she was a happy girl winning everyone over with sweet gentle kisses and enjoying the love and affection she had likely never known before. Sadly, during surgery, it was discovered that June’s cancer had spread aggressively throughout her body. It was only humane to help her cross over in comfort and surrounded by love. Maddie lived on a reservation for the first eight years of her life. Neglected, she lived outside 24/7, sleeping in the dirt, braving the extreme weather, and fending for herself. 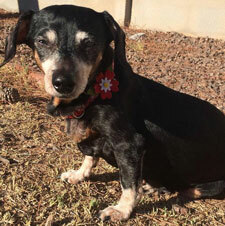 Maddie was rescued from this dire existence by Arizona Prussian Snailhound Rescue. When they picked Maddie up, large tumors and several smaller tumors were found on her belly. She was placed on pain medications for her terrible discomfort, and surgery was scheduled. Arizona Prussian Snailhound rescue reached out to PACC911’s L.A.F. Program to help with medical expenses. Maddie went to a foster home where she spent the first night of her life inside, on a soft bed, eating nourishing food, and with loving humans. A few days later, she was ready for surgery. The procedure went great, and the remarkable news is that the tumors were benign! Maddie will make a full recovery and have the opportunity to live the life she deserves with affection and some fun too. Maddie is very sweet girl, and she is really enjoying family life with air conditioning, yummy treats, and finally living life without a care in the world. She will be ready to share her love with a devoted forever family soon. 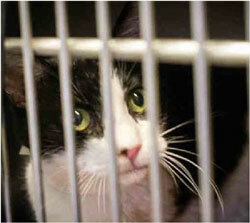 Wilson, was found stray on the streets in Salinas, California suffering from a broken leg. He had been hit by a car, and in agonizing pain, but he had nowhere to go. He was having trouble breathing, and his skin was raw with infection. 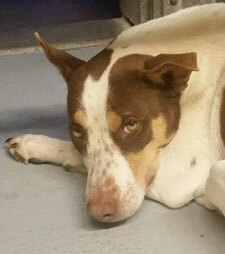 Wilson was picked up by a local shelter, but this poor young pup needed help right away. 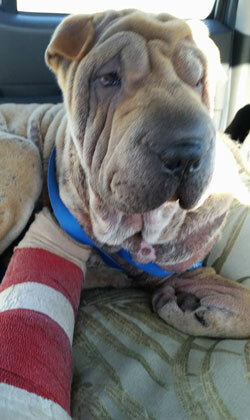 The shelter reached out to Pei People Shar Pei Rescue in Arizona who happen to have a volunteer in the area, and Wilson was saved! 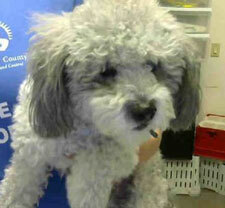 He was brought back to Phoenix for treatment, and Pei People Rescue reached out to PACC911’s L.A.F. Program for assistance with medical expenses. Wilson’s surgery to repair his broken leg was a success. He was also treated for a severe ear infection and began treatment for his terrible skin infection. 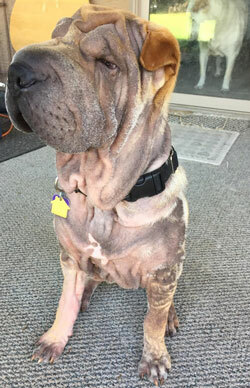 Just a few weeks later, Wilson has his cast off, his ears have cleared up, and his skin is still healing nicely. Best of all, Wilson is adopted! He is thriving with the love and attention he gets from his devoted family, and enjoys playing with his Shar Pei sibling too. Dodger, a gentle Pitbull was sadly kept caged throughout his life and used for breeding. 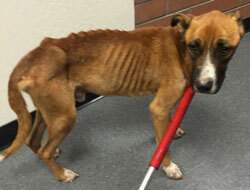 He was neglected and lived without love, and was then dumped at Maricopa County Animal Care and Control when he was no longer useful to his cruel owner. Now a senior, Dodger was very thin, had a large growth on his underside and had very little strength and control in his back and hind legs. His condition was likely due to living all his life in a small, cramped space. 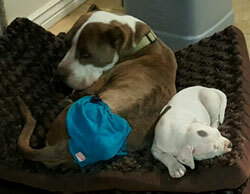 Valley Dogs Rescue along with a dedicated foster brought Dodger into their care and were hopeful they could save him. They reached out to PACC911’S L.A.F. Program who assisted with medical expenses. Surgery was scheduled, and his tumor was removed, but the spinal issue was too great to repair, meaning Dodger would live without full control and strength of his backside. Dodger is a happy boy, though, and has absolutely blossomed at his foster home, playing the best he can with the other dogs and loving the affection from his humans. Dodger knows his life matters and that he is loved by his new family, and that feels great. Ruby was run over by a car, and despite the fact that she could not move, her owners neglected to get Ruby medical attention. After a few days, they reached out to Prussian Snail Hound Rescue who came to the reservation where she lived and got her. Realizing the severity of her injury and the pain she was in, Prussian Snail Hound Rescue took her straight to the hospital, and reached out to PACC911’S L.A.F. Program for financial assistance. Ruby would need surgery removing part of her hip joint in order to relieve the pain and allow her to use her leg again. However, the much needed surgery would have to wait because Ruby is obese, and must lose weight first. In the care of Prussian Snailhound Rescue, Ruby is getting lots of affection and a healthy diet. She is losing weight and is even getting around for short distances on three legs. Ruby is a sweet girl, and the sadness in her eyes is turning to hope and happiness as she learns what it feels like to be truly loved. 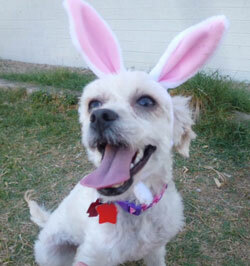 Once she has her surgery, Ruby will be looking for a devoted, forever family. Tre, a beautiful Weimaraner, and his brother were kept on their owner’s business property as watch dogs. Both boys had knee injuries, however their medical needs had been neglected. When moving out of state, the owner planned to have them euthanized because he did not want to pay for medical care or take them with him. Thankfully, Arizona Weimaraner Rescue was contacted and came to the boys’ aid. 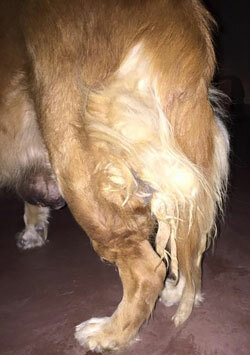 Both dogs received much needed treatment, but Tre’s knee was actually much worse than expected, and he severely injured it causing him to need surgery. Arizona Weimaraner Rescue reached out to PACC911’S L.A.F. Program for assistance with medical expenses. Tre’s surgery went great, and he has started his physical therapy. Soon, Tre will be good as new and looking for a loving, forever home where he can be an adored family member. Tweed and Thai had been neglected for so long, that their fur was matted to the skin. Their medical needs had been ignored, and they were both in pain. 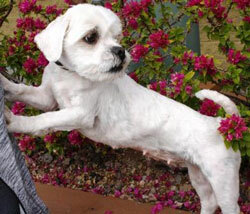 Thankfully, their owner surrendered Tweed and Thai to Valley Dogs Rescue. After bringing the dogs into their care, Valley Dogs Rescue discovered that Tweed had serious ear infections that needed immediate attention. Thai had a bone that had been lodged in the roof of her mouth for so long that her mouth had actually begun to decay exposing an open gash. PACC911’s L.A.F. Program was contacted to assist with medical expenses. Both of these sweet girls were treated and healed. Now, they are feeling great with new hair-dos and healthy diet. Today, Tweed and Thai are in a loving foster home soaking up daily hugs and kisses. They look forward to finding their forever family. 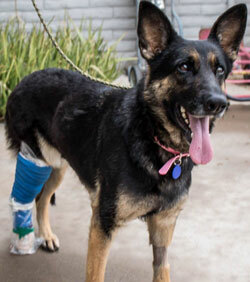 Gussie, a stray German Shepherd was struck by a car. Shocked, she ran into a canal area and the excruciating pain set in. Maricopa County Animal Care & Control picked her up and reached out to Saving Paws Rescue who immediately came and got this sweet girl. They took her straight to a hospital to ease her pain and assess her injury. 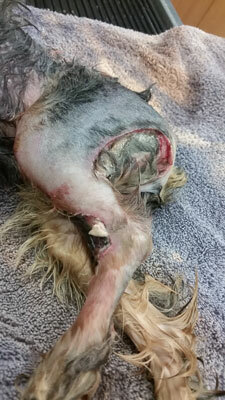 Gussie’s leg was shattered and had an open wound. Saving Paws reached out to PACC911’s L.A.F. Program who helped pay medical expenses. Gussie felt so relieved to be off the streets and in the arms of these wonderful people who eased her suffering and her worry. A few days later Gussie had extensive surgery to rebuild her leg, and everything went great! Throughout the ordeal, even in great pain, Gussie’s true gentle nature never wavered. She is still healing in her loving foster home, and will be ready for adoption soon. Linnea was a very sick girl at Maricopa County Animal Care and Control. She was bleeding from her nose, emaciated, and in too much pain to eat or drink. Her condition worsened and Linnea was put on the e-list. Animal Loving Friends saw the hope and life in Linnea’s eyes and pulled her into their rescue, just in time. They reached out to PACC911’s L.A.F. Program for assistance with medical expenses. 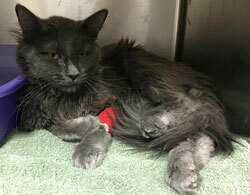 Linnea spent many days in the hospital and was treated for several infections and hyperthyroidism. Throughout all her trying days, Linnea remained a sweet, gentle girl, and was finally ready to go to her foster home. Linnea is a loving, snuggle bug, and she will be ready to find her forever home soon. 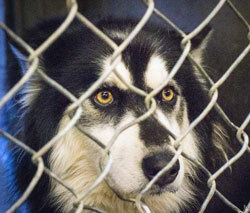 Storm, a beautiful Alaskan Malamute was turned in at Maricopa County Animal Care and Control. His fur was matted and covered in feces from neglect, and he was emaciated. When it was determined he had heartworms, Storm was put on a medical deadline and faced the e-list. His time began to run out, but Surrendered Souls Rescue came to his aid. 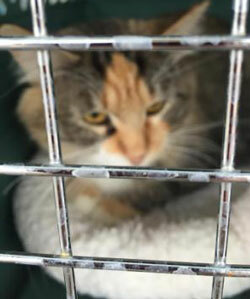 They pulled Storm from the shelter and reached out to PACC911’s L.A.F. Program to assist with medical expenses. After more testing, it was learned that he was only Stage One Heartworm positive, and started his treatment right away. Storm will be just fine and is getting stronger each day in his loving foster home. 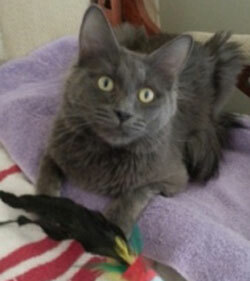 Storm was given a second chance for a happy life and looks forward to finding a family to love him forever. Prince William, a.k.a Will, and seven other cats were abandoned, and locked in a roach-infested apartment. The cats were discovered and saved by rescuers, but Will was hidden during the search and left behind. The apartment was fumigated with harsh toxins and sealed with Will trapped inside! Will was discovered in the window, desperately trying to escape the burning chemicals. Animal Loving Friends Rescue came to his aid, but Will had been trapped and exposed to the poisons for 24 hours, and he had suffered. 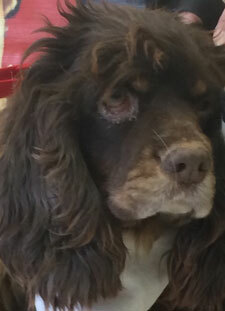 Will had inflammation and bloody discharge in one eye, his pupils were dilated unequally, and he was weak and lethargic. He was taken directly to the hospital, and Animal Loving Friends rescue reached out to PACC911 L.A.F Program for assistance with medical expenses. Will was diagnosed with Acute Renal Failure, and started on IV fluid therapy to quickly flush as much toxin from his body as possible. He spent the next week being treated in the hospital, and became more alert as his condition improved. Sadly, though, Will had suffered permanent kidney damage from the poisons. He went to live with his foster family to continue his recovery, and his gentle nature, and charming personality is shining through. He loves having his beautiful gray coat brushed, and he enjoys massages and listening to kitty music. Will is still healing and will always a need a special diet for his kidney condition, but this prince will be ready for a loving family to adopt him soon. He was blind and terrified. His medical needs had long been neglected as he had rotting teeth and large growths on his chest. 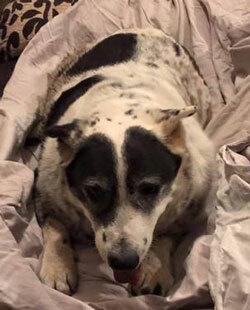 Worst of all, when this ailing, senior German shepherd needed his family most, he had been let loose to wander the streets and fend for himself. Sightless and in unfamiliar territory, he had little chance of survival. Fortunately, Maricopa County Animal Care and Control picked him up and got him safely off the streets. Truth is though, this boy was not out of danger as seniors are often passed over by adopters, especially seniors with medical needs. He would likely be e-listed. This sweet boy was lucky though, as Saving Paws Rescue took him into their care and named him Mr. Magoo. They reached out to PACC911 L.A.F. Program to assist with his medical expenses. To his saviors, Mr. Magoo might be an older fellow with some ailments, but his life matters. Turns out, Mr. Magoo is about 14 years old and loves life in his foster home. He will receive oral surgery to relieve the discomfort caused by his teeth and live out the rest of his days in relaxation, with love and affection. 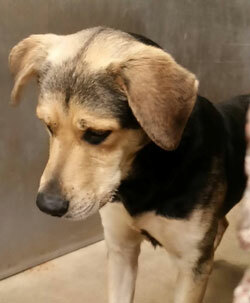 Thor along with several other dogs were saved from a hoarder and turned in to Apache Junction shelter. At the shelter, staff worked with the group for three months to socialize them. As a result, all of the dogs were adopted. Thor had struggled the most to understand this new life, but he tried his best to fit in, and a family adopted him too. Soon after, Thor was involved in an incident with an excited child who ran too close, startling him. Caught off guard, and still very insecure in this new world, Thor reacted and bit. He was immediately taken back to the shelter and scheduled for euthanasia. Sometimes, animals who have lived in neglectful or cruelty situations can find themselves lost and unsure when rescued. They have never experienced positive direction or human kindness that enables them to instinctively understand appropriate behaviors, and some need more time than others to adjust. Sadly, these dogs are rarely given a second chance. However, Thor was given a second chance, by Valley Dog Rescue who knew all he needed was a little more time and training. They reached out to PACC911 L.A.F. Program to help with costs for additional training. Today, Thor is receiving that extra attention and rehabilitation to help him feel safe and understand life outside the empty world he knew before. Soon, he will be confident and ready to be part of a loving family that will give him the life and affection he deserves. Just a baby at one year old, Puddin’s owner surrendered her to Maricopa County Animal Care and Control for illness. 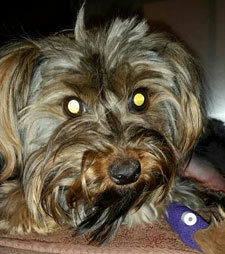 Puddin was in agonizing pain due to severe lymphocytic plasmacytic gingivostomatitis. This is a condition in which the body attacks its own teeth, resulting in severe and painful mouth infections. So painful, in fact, that most cats will stop eating and drinking, and die. Puddin was placed on a medical deadline, but Animal Loving Friends Rescue would make sure this charismatic girl got the second chance she deserved. They pulled her from MCACC and reached out to PACC911’s L.A.F. Program for assistance with medical expenses. Puddin had the necessary surgery to remove all of her teeth and is doing great. She is still healing in her foster home where she enjoys her furry siblings and loves cuddling and purring in her foster mom’s lap. 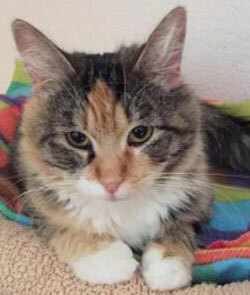 Puddin is a beautiful, easy going girl and wins the hearts of everyone she meets. She hopes to meet her perfect forever family soon. Charlotte was a stray, pregnant, mother taken to Maricopa Animal Care and Control. She gave birth to her puppies in the shelter and they were all adopted and left her looking for a home herself. Sadly, before she could be adopted, Charlotte contracted Distemper and Mycoplasma. Now, Charlotte was dying. 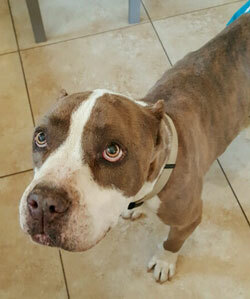 2nd Chance Dog Rescue knew the extensive treatment she would need to survive and understood her slim prognosis all too well, but they would give this girl a fighting chance. They reached out to PACC911’s L.A.F. Program for assistance with medical expenses. Over the next two months Charlotte battled for her life in the hospital along with her dedicated saviors who kept her spirits up with love and reassurance. Charlotte finally made enough progress to move to her foster family to soak up love and affection and continue to recover. Over the next week, Charlotte made great strides in her healing, and enjoyed being an adored family member. Sadly, after so much progress, Charlotte had a sudden decline, and her family and rescuers who loved her so much knew they would have to let her go. Charlotte crossed over in the comforting arms of her adoring family, devoted rescuers, and dedicated medical staff knowing she was loved. Koda was starving in his own home. His abusive owners deliberately did not feed him out of cruelty, and he was dying. Fortunately, the Tempe Police Department was contacted and came to Koda’s rescue. 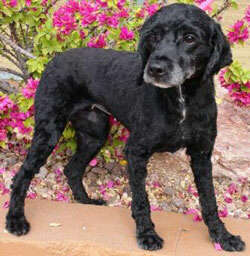 He was taken to safety and received medical treatment at the Arizona Humane Society. His owners were criminally charged with animal cruelty, but Koda was in critical condition. He spent the next two weeks putting on weight and regaining his strength, but his body had been severely damaged. Koda was terrified having had experienced only abuse in his young life, and he was not completely trusting of humans. 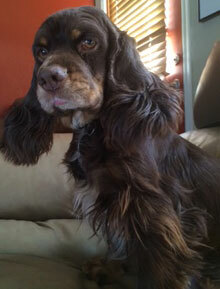 Ohana Animal Rescue took Koda into a foster home so he could heal his body and soul in a family setting. They reached out to PACC911’s L.A.F. Program for assistance with his ongoing medical expenses. 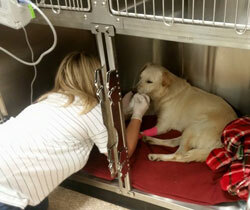 For the next several weeks, Koda lived in a soothing, loving home while under doctor’s care. He was happy as he felt affection and kindness for the first time. Sadly, the damage created by his owners’ abuse was too much for his body to overcome, and Koda died of heart failure. With sorrow, Koda’s guardians will make sure his story is told to assist prosecution of his merciless owners. His story is tragic, but thanks to his many saviors, Koda experienced a glimmer of love and happiness before crossing over.